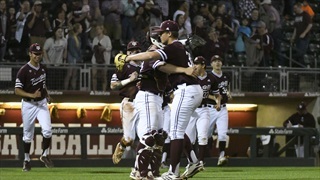 Despite nearly mounting a heroic comeback, the Aggies didn't play their best ball on Friday night as they opened SEC play against the Vanderbilt Commodores and lost game one of the weekend series, 7-4. In what turned out to be a battle between pitching staffs, the Aggies took down Gonzaga, 3-1, to clinch a series win over the Bulldogs. Allonte Wingate hit two RBI singles which proved to be the difference in the game for the maroon and white. 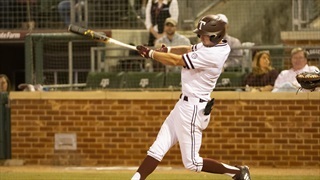 After an opening loss to Gonzaga, Texas A&M rallied back in an enormous way, scoring 14 runs. 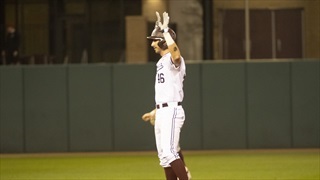 It was a 15 hit performance for the Maroon and White including a grand slam from Ty Coleman. 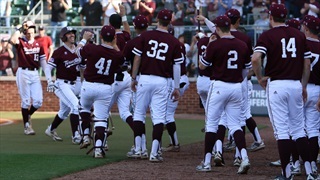 Tomorrow at noon, the Ags look to keep the bats going to seal the series win. 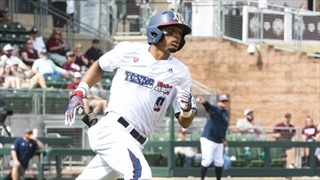 The Aggie offense finally had a strong outing, with the team amassing 10 hits through seven innings and piling on 12 runs over the A&M Islanders of Corpus Christi. Braden Shewmake and Cam Blake led the way for the Aggies, and Mikey Hoehner got two hits of his own. Since the arrival of Mikey Hoehner, the junior college transfer has made an immediate impact on and off the field. 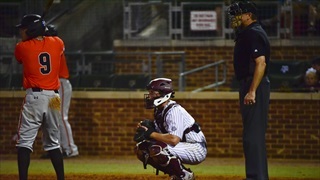 Hoehner has gelled with not just the pitching staff, but the entire roster on his way to becoming the Aggies' starting catcher. 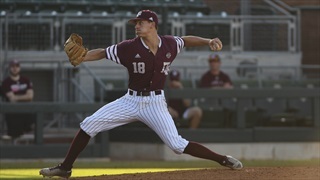 The pitching staff again headlined the week for the A&M baseball team as the Aggies' starters all notched impressive performances on the mound. 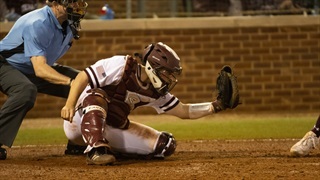 However, the maroon and white again struggled at the dish. 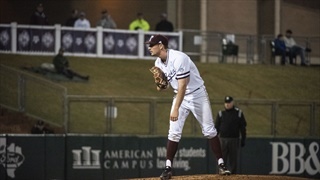 Gabe Bock analyzes the week in Aggie baseball with a big weekend slate ahead. The Ags won the first two games of the season, but fell to the Flames in the third game of the season, 7-2. Texas A&M struck first in the contest, but the Flames scored the final seven runs to knock the Aggies from the ranks of the unbeaten. 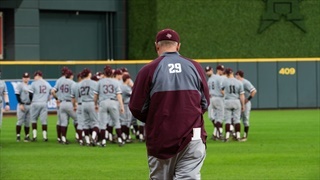 Texas A&M downed the Flames of Illinois-Chicago, 3-1, on Friday night as John Doxakis earned his second win on the season. 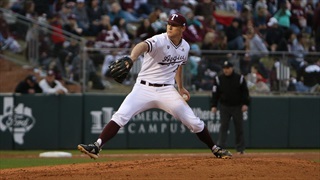 While the A&M bats didn't do much tonight, the Aggies leaned on their experienced pitching staff and excellent glove work to earn the victory. Texas A&M swept a solid Fordham club on opening weekend. 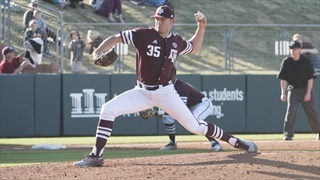 Perhaps more importantly, both Aggie veterans and newcomers showed a number of encouraging signs, starting with the dominance of three lefty starters and several impressive performances at the plate. Texas A&M opens up their 2019 campaign this weekend against the Fordham Rams. 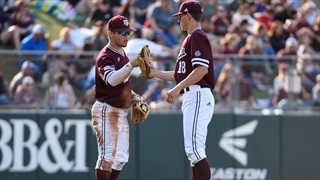 The Aggies return a great core of players, including All American John Doxakis and shortstop phenom Braden Shewmake. David Sandhop gets you set for Opening Day at Blue Bell Park. 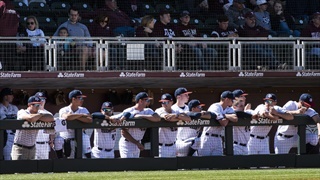 Even with so much experience returning in the lineup and defensively, the smattering of transfers on the Aggie baseball roster could be the key to a big season on the diamond. Ryan Brauninger takes a look as Opening Day approaches. In the first scrimmage of the Omaha Cup, Team Pinstripes took the lead in the bottom of the fifth and didn't look back, downing Team Maroon 9-4. Houston Baptist transfer Jonathan Ducoff (3-for-3) highlighted an electric Pinstripe offense. The Aggies brought out the bats in a Friday night scrimmage against the Bearkats of Sam Houston State, defeating them 11-3. 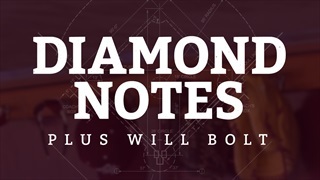 David Sandhop breaks down the early returns on the first look at the soon-to-be 2019 Texas A&M squad.